RL-750 Rotary Laminating Press | Black Bros. The Black Bros. RL-750 Laminating Press is a basic Rotary Laminator, which is ideal for laminating sheet-to-sheet materials. It is adept in many different applications, delivering bonding nip pressure up to 2000 pounds. Common uses include nip and stack lines using solvent or water based contact cements. The RL is often paired with our 775 Hot Melt PUR Spreader to provide fast, reliable, laminating pressure. 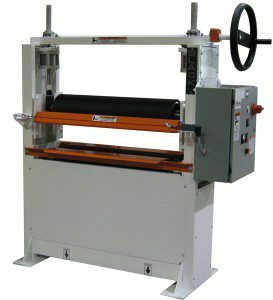 The RL-750 features 7 1/2 inch laminating rolls arranged with variable speed drive on lower roll and durable safety guards to prevent pinch accidents.